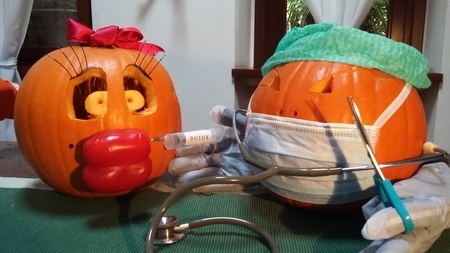 Even pumpkins want to look beautiful, and they do it the same way humans do: by injecting half a bell pepper into their lips. I'm pretty sure that's how botox works. There's even a pumpkin doctor doing the procedure. I wonder if he got his medical degree from Johns Pumpkins University.